Back in April, Serious-Parody revealed their upcoming PSN exclusive wrestling game 5 Star Wrestling. If you still want to know more after our last interview, the dev’s CEO Dan Hinkles has responded to fans’ questions in their first Q&A for their upcoming PSN exclusive. “On April 10th, we invited the 5 Star Wrestling Facebook community to submit their questions for our team to answer. I’d like to take this opportunity to say a big thank you to all those who submitted questions, we had far more than we could have anticipated so in order to make things fair, we drew the questions from a hat. If your question wasn’t answered or you didn’t submit any questions, you’ll be pleased to know that this is only part 1 and we will be answering some more questions very soon. Check http://Facebook.com/5StarWrestling for details. By now, you’ve seen our first ‘Dev Clip’ highlighting one of the key gameplay features we’re bringing to 5 Star Wrestling. Could Cena’s injury angle have been timed any better? There’ll be more videos coming very soon. As the makers of Wrestling Manager for iPhone, we are dying to put a feature like that in 5 Star Wrestling. This is something we will aim to bring you down the line, potentially as DLC but it’s not something that will be in the game at launch. 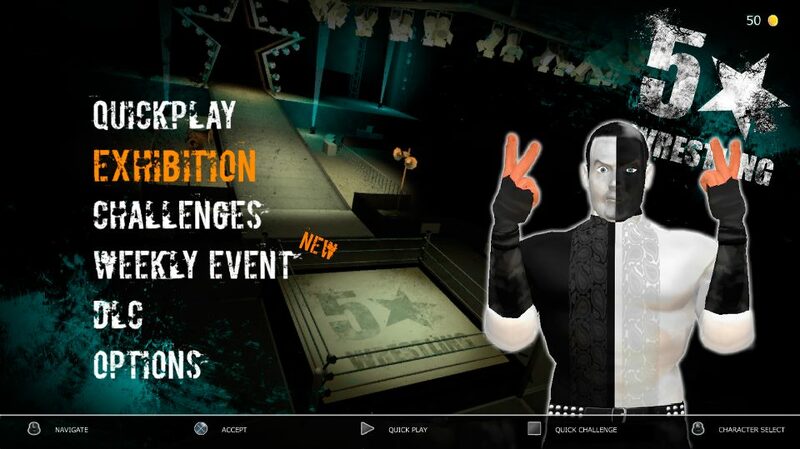 Much like WWE ’13, our main single player mode is a Challenge Mode. The one I’d most like it to be compared with is WCW vs NWO: World Tour. The reason we all know and love No Mercy, is because the developers nailed the gameplay in World Tour, then built on that with tons of features. That’s what we are doing. The difference is, THQ had to release a sequel in order to add more features, where as we can release new content as soon as we have made it. When I ask people what their favorite wrestling games are, I’m never surprised when they say Revenge, Here Comes The Pain or No Mercy, none of them needed online for us to enjoy them and believe me, neither does 5 Star Wrestling. We’re not ruling anything out when it comes to DLC because we have big plans for this game post release but online gameplay will not be part of the game at launch. I know it’s strange not having online gameplay these days but we’re a small team and we have to choose where we put our resources. Think about it like this, if the creators of TNA Impact had chopped the Online aspect of their game, they could have had those programmers putting in the basics like ‘Back Grapples’ and making sure key characters like Kurt Angle had his ‘Ankle Lock’. The game could have had more moves in general which would have significantly improved it. Instead they were left with an online feature that nobody wanted to play because most people got bored of the gameplay very quickly. I see no reason why we need to compete. I’m a huge fan of wrestling games and I play them all. That said, if you only buy one this year, you have a choice. You can either spend big and get another Yukes made wrestling game or you can try something new for a lot less money. 5 Star Wrestling is bringing a ton of innovation to the wrestling genre. It will be out several months before the WWE game and at less than half the price of a WWE game. IT IS A STEAL for wrestling gamers! 5 Star Wrestling is the Pro Evolution of Professional Wrestling games. We don’t have any licenses and there’s a big advantage to that. Have you ever wondered how good the WWE games might be if they didn’t have to take out every person that left the WWE? There has been over 400 wrestlers in the Smackdown series. We will never have to take a character out of our game. Just think how big our game will get. The wrestler isn’t rendered completely useless, he just has to approach the rest of the match with caution. There’s a damage recovery system that will restore parts of your health if you don’t take any further damage and you will still be able to hit some lift up moves but every time you try one, there is a risk that your leg will blow again. There’s nothing stopping you making a dramatic comeback. At launch we have 1 masked wrestler. Question 9 by Peter Pinto: Any chance it will play like No Mercy at all?? No Mercy is one of my all time favorite games. I’ve spent years playing it and know the game inside out. It has unquestionably influenced my design with this game. The vast majority of our move positions are in No Mercy, there is a momentum system too. Also, No Mercy had more moves per wrestler than any other game (153) which is one of the main reasons the gameplay is so varied and we’ll have even more than No Mercy. But I’m not going to say this is the next No Mercy. Every developer does that and it’s as cheap as Mick Foley saying ‘Right here in…_________ City!’. As you can see with our Dev Clip, we are bringing something fresh and there’s a whole lot more than that coming too. Question 10 by David Penton: So what will the DLC be? I can’t make any announcements about future content but I can say we aim to bring more DLC than all of the WWE games combined. We’re not looking at this as our chance to make a yearly sequel. We’re looking at this as our chance to build a game that keeps on offering new fun ways to play, with new characters and new game modes. Remember to follow their Twitter @5StarWrestlin for all updates straight from the developer. This entry was posted in Featured, WWE '13. Bookmark the permalink.